Private investigator Jesper MacMillian was sure he’d seen it all. After all, in a city like San Francisco, strange is what’s for breakfast. Following a long recovery after a horrific accident, his life is finally the way he wants it- or at least, close enough. The only monsters on his radar are the ones that keep him awake at night. Before MacMillian has a chance to brace for impact, Lena drags him into a world where monsters aren’t just real, they’re hiding in plain sight. Suddenly, everything he knows is suspect, starting with his current case. For Lena, a medium since childhood, it’s just another day at the office. For MacMillian, it’s the beginning of the end of everything he thinks he knows. He gave her a blank look. He thought for a moment. “No. Never saw their face. Don’t even remember what happened, really. Not until, well, you know.” He winced down at his chest. “Just, I dunno, tell my folks I love them. And tell my brothers to quit giving our dále such a hard time. And maybe you could tell my mamío-” He stopped. A confused look flitted across his features. Lena strengthened her shields. At the same time, she reached out. Energy was all over the room: Jimmy’s, hers, even energy from the last couple who had lived there. She could feel it when she focused, crackling all around her like a broken net of superheated thread. Jimmy’s eyes rolled back in his head. He let out a shriek that chilled her to her core, and disappeared. 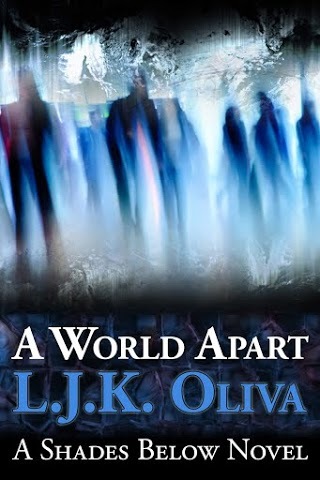 This entry was posted in Cover Reveals and tagged A Shades Below, A World Apart, Blog Train, books, Cover Art, cover reveal, excerpt, L.J.K. Oliva by Mia Bishop. Bookmark the permalink.